A cautionary tale from the Limba of Sierra Leone. Mabela’s father teaches her cleverness. So when the cat attempts to initiate the mice into his “secret society” she is alert and saves the day. But not before a lot of fun marching and singing on the part of all. Children love shouting out the “FO FENG!” each time the cat pounces. Somehow I think this little tale might save lives. I remember being charged by an out of control car one day when I was eight. I escaped the car’s wheels only because I had my ears and eyes open and…as Mabela learned…MOVED FAST! By all means act this out after you have read it once! You will need another adult to be the “cat” and catch the mice and stuff them into a “bag” holding space. One teller used a hula hoop to catch the mice! 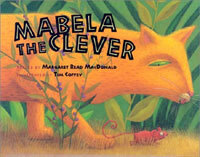 Sandy Zell, of the Bellingham Public Library, has created this delightful Reader’s Theater for Mabela the Clever. Sandy uses this in a format she calls "junior theatre". Children of all ages come for the program. http://www.youtube.com/watch?v=-a3qK86zJgs Birte Hansen plays Mabela with her Kindergarten.